Hausa hiphop artist Ziriums (Nazir Hausawa) will take part in an African Hip Hop event at the Alachua County Library Headquarters, in Gainesville, Florida, USA, on Saturday 23 February 2013. Ziriums was featured in the documentary Recording a Revolution, by Alex Johnson and Saman Piracha, which will screen 10am-11am. 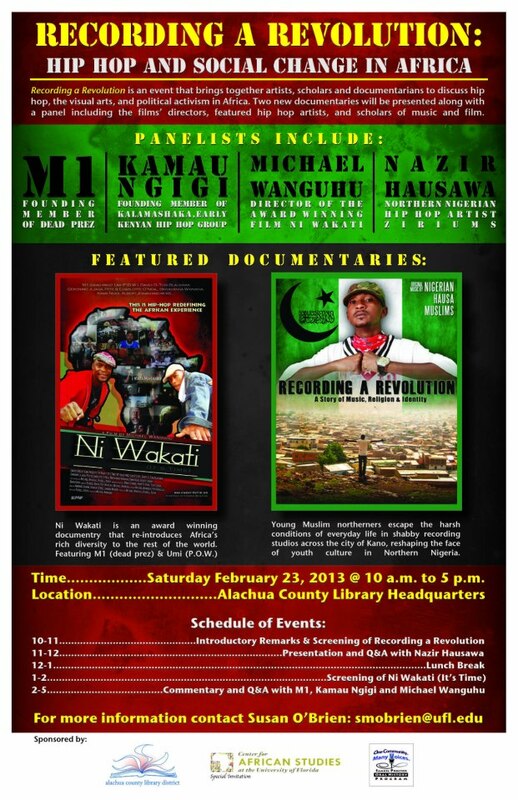 Ziriums will host a Q&A from 11am-12pm The event also features discussions with founding member of Dead Prez M1, Kamau Ngigi, founding member of Kalamashaka, a Kenyan Hip Hop group, and Michael Wanguhu, the director of the award winning documentary Ni Wakati (It’s Time), which will screen from 1-2pm. The event is sponsored by the Center for African Studies at the University of Florida and the Alachua County Library District. For more information, see the poster and the press release below. Recording a Revolution is an event that brings together artists, scholars and documentary filmmakers to discuss hip hop, the visual arts, and political activism in Africa. Two new documentaries will be presented along with a panel including the films’ directors/producers and featured hip hop artists, including American hip hop artist M1, founding member of dead prez. This panel will discuss the challenges and opportunities associated with the representation of and by artists/activists of Africa and the African diaspora, and open up a public dialogue about social and political concerns in Africa. As it coincides with Black History Month, this event will also encourage a discussion between the historical linkages between Africa and its diaspora. The two African hip hop artists – Nazir Hausawa (aka ‘Ziriums’) of Nigeria and Kamau Ngigi of Kenya – will arrive several days before the event. If anyone is interested in meeting with them on Thursday or Friday (February 21-22), or would like more information about the featured movies or artists, please contact Sue O’Brien (smobrien@ufl.edu). This event is sponsored by the Alachua County Public Library, as well as the Center for African Studies and the Samuel Proctor Oral History Program at the University of Florida. This entry was posted in African cinema, American film, documentary, Events in the United States, Hausa music, Nigerian music, Screenings and tagged African Hip Hop, Alachua County Library Headquarters., Hausa hiphop, Hausa music, Hip Hop, Kamau Ngugi, M1, Michael Wanguhu, Ni Wakati, Recording a Revolution, Ziriums. Bookmark the permalink. Reblogged this on Sharon Abramowitz, Ph.D..